Sebastian 20, has autism, learning disability and a past history of mental health difficulties. Four years ago, things were not so great for Sebastian. He was suffering with extreme anxiety, self-harm and depression, this was most definitely caused by the poor transition into further education, from his SEN school. At 16 with no FE establishment able to meet Sebastian’s needs, he was placed in a school for students with much more profound learning disabilities. His mental health deteriorated to such a point that he tried to take his own life. It wasn’t with the intention to die, but to stop the misery of a rotten system which fails our children miserably. A difficult fight ensued with the local authority, in order to get the correct education for Seb. After a long battle Sebastian was allocated a place at Autism Anglia’s Doucecroft school. The school has in-depth understanding and knowledge of autism, including all the difficulties associated with that diagnosis. I walked through the front door of Doucecroft as a parent who was fragile, bruised and emotionally drained and felt this enormous care, understanding and love. Seb says, “when I first started at Doucecroft I wasn’t very well with my mental health, but all the staff there really understood me and for the first time in years I was truly happy. Sebastian has always been a gentle young man, he is considerate and has a natural humility. It was no surprise to anyone when Sebastian voiced his wish to serve God. Sebastian’s journey has met many obstacles, because Churches often seem to overlook and exclude individuals with disabilities. However, Holywell are determined to get this right for Sebastian, they have listened and supported Sebastian to fulfil his potential to serve God. Father Mark the Prior in charge, totally understands Sebastian, but also remembers me as his mum and the need to have regular updates and a reassurance that all is well. Last year I was a guest at Lambeth Palace and met Justin Welby, where I was able to discuss vocation and autism. However, the church has a massive amount to do in order to be a place of true belonging for people who have a vocational calling and a learning disability. Sebastian has the biggest Christian heart you could ever know and I have shielded him from comments from the hierarchy within the church. Seb can only stay at Holywell for a maximum of two years, so preparation for his next steps need to be well thought out and underway now. 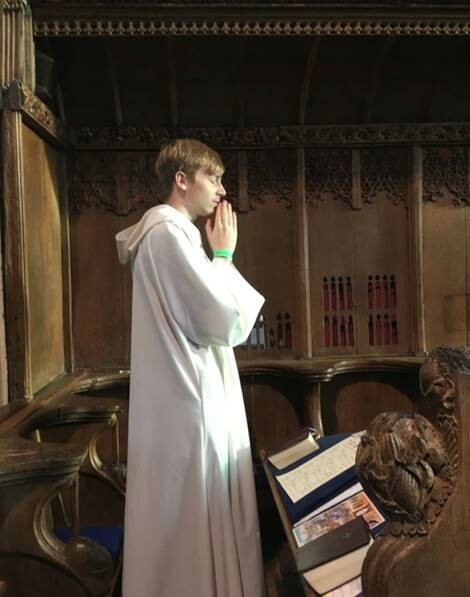 Seb wants to be a priest, but I have not found one theological college prepared to take him.When I make enquiries I am asked “ how many A levels does he have?” “I suppose the same as Jesus, and great at carpentry,” is my usual response.